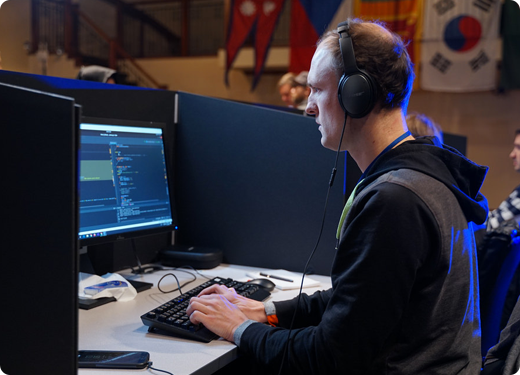 The 2018 Topcoder Open Marathon Competition (“Marathon Competition”) will take place between April 14, 2018 and the onsite finals in the USA at a location TBD. The Marathon Competition will consist of four (4) Online Rounds and potentially a number of Lightning Rounds at regional events. Up to twelve (12) of the highest scoring competitors overall will win a trip to the Tournament to compete in the onsite Championship Round. The Coding Phase is a timed event where all Competitors are presented with the same problem statement. The criteria for scoring a Competitor’s submission will be provided with the problem statement and may change from round to round. During each round of the Marathon Competition, each Competitor may submit one of two types of submissions: an Example Submission or a Full Submission. Each Example Submission is run against the example test cases listed in the problem statement and detailed feedback is provided to the Competitor. Each Full Submission is run against a more complete set of test cases which are not disclosed to the Competitor and the Competitor only receives a provisional score. The duration of the Coding Phase for each of the Online Rounds is 1 week. The winner of each match [among those eligible, who have not already otherwise advanced] will automatically earn a trip to the TCO18 Marathon Match Finals. After each Online Round, up to 30 of the next-highest scoring competitors [among those eligible, who have not already otherwise advanced] will be awarded points based on the following table. To get points for the round, a Competitor must submit a Full Submission and achieve a score greater than zero. If several competitors are tied for a place, they share points for the tied places (i.e. if two competitors are tied for 6th place they’ll each get (40+36)/2 = 38 points). A placement of 31st – 50th will earn 1 point. Eight (8) Competitors who will accumulate the most points during all Online Rounds will advance to the onsite Championship Round. ** To get the prize, Competitor must have positive points after Online Rounds. In the event of a tie in for the 150th place, all competitors with that score will earn a t-shirt. These rules may change with or without prior notice.